Seven and a half months into this project there are still some things that surprise me about Bob Dylan, and, very rarely, there are still some things that astound me. This morning fell into the latter category, where I found myself watching a 1994 video of Dylan and thinking “Wait, what? He could still perform like this?”. The place was Nara, Japan. UNESCO had the very good idea of producing a series of concerts at UNESCO World Heritage Sites in order to draw attention to them. Get a bunch of big western musical stars to come to Japan to perform with traditional Japanese artists at the Buddhist temple at Todai-ji and call it The Great Music Experience (it sounds inelegant, but perhaps it scans better in Japanese). The whole thing was produced by Tony Hollingsworth, orchestrated by Michael Kamen, and Beatles producer George Martin was there, in the role of the guy with enough gravitas to tell people what to do and actually be listened to. The list of western stars was a bit mid-1990s: INXS, Jon Bon Jovi (who was apparently terrible), Richie Sambora, Ry Cooder, The Chieftains, and Joni Mitchell. The show also featured the Chiba-based heavy metal band X Japan, whose fans were unruly. The idea was to bring two musical cultures into dialogue through rehearsals, and then play three shows (May 20-22) with the third one broadcast worldwide. I have no memory of this show at all, so if it was broadcast in Canada I completely missed it. You can watch the whole thing here on YouTube, or skip ahead to the Dylan section (48:30). I’ll wait. Wasn’t that incredible? Who knew Dylan could still sing that way? 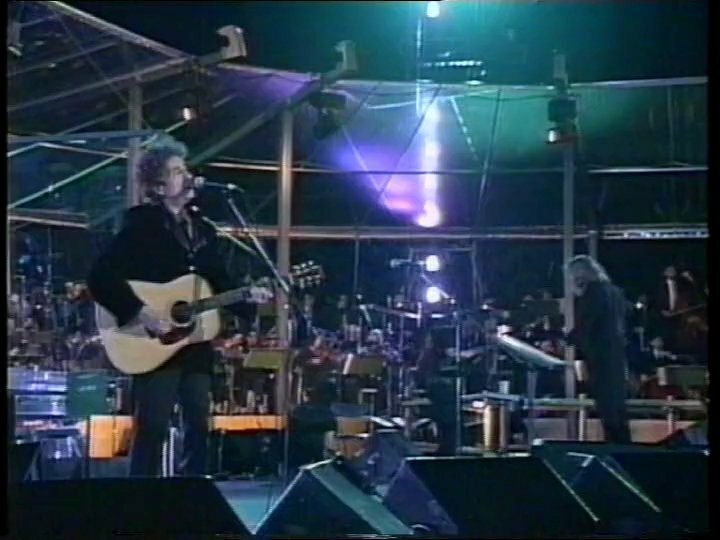 This was the first time that Dylan ever played with an orchestra (the Tokyo New Philharmonic Orchestra). That completely changes the way that he has to approach the song. As Hollingsworth’s remarkable blog on the event (I strongly recommend this article) makes clear, for the first time probably ever Dylan was following a band rather than leading them. A sixty piece orchestra is playing from sheet music – they are not going to improv with him like GE Smith – he has to sing it the way that they practiced it or the whole thing is going to fall apart. Apparently this approach – or the venue, or the sushi, who knows? – brought something out of Dylan, because that is just about the most beautiful version of “A Hard Rain’s A-Gonna Fall” that he’s ever sung. It is really an eye-opening revelation. Yesterday I was writing about how Dylan should have toured doing his acoustic band versions of songs to breathe new life into his music. Today I’m thinking he should have done a tour with a full-fledged orchestra. The fact is that Dylan definitely still had it in him – there can be no doubt of that after this – it’s just that he only rarely let it all out. 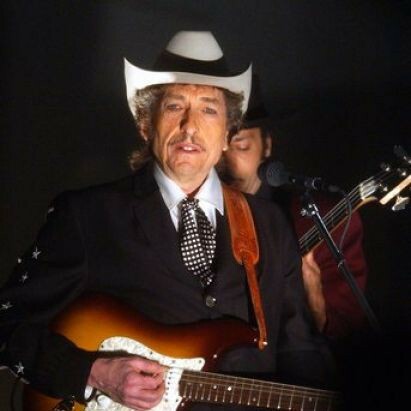 Dylan and the orchestra did the same three songs each night – “Hard Rain”, “I Shall Be Released” and “Ring Them Bells”. On the last, they use bells from the temple and it is a lovely effect as well. I’ve only heard this night’s performance, but it sounds like all three nights were remarkable. Quite the surprise for a Sunday morning in 1994 of the Long and Wasted Year. As a bit of redress for all the times I show up here to say, “You’re wrong!,” let me say: you’re quite right–that’s very, very nice. I’m not totally in love with everything the orchestra itself is doing, but it elicits a superb vocal performance from Himself.